Most Saturday evenings you can find some of the best shooters in the area competing head to head in action pistol matches. The format of the matches alternates between Defensive Pistol (IDPA style) and USPSA. Tuesday evenings are our bowling pin shoots. New shooters are joining us every week and experiencing the fun and excitement of The Armory and Indoor Range matches. Our match directors and veteran competitors are more than willing to work with "newbies" and get them comfortable with the rules and safety regulations required to participate. ​​​The Armory and Indoor Range is a registered United States Practical Pistol Association club. If you are a USPSA member, your match and qualifier scores are registered on the USPSA web site and go towards your national ranking. 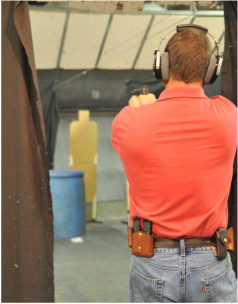 USPSA matches are a test of your "run and gun" while safely and accurately engaging targets and avoiding the occasional no-shoot target. (p.s. you don't really have to run"). ​​​If you are looking for a shooting experience to test your mettle in a threat scenario (minus bad guys shooting back) the defensive pistol match is for you. Navigate threat scenarios while practicing good habits (like not walking out into the open with an empty firearm). Great way to practice your trigger control and sight alignment in fun and exciting head to head match. If spray and pray is more your style you can give that a try as well. Calibers from 22LR to 45ACP may used to knock these pins to the ground.